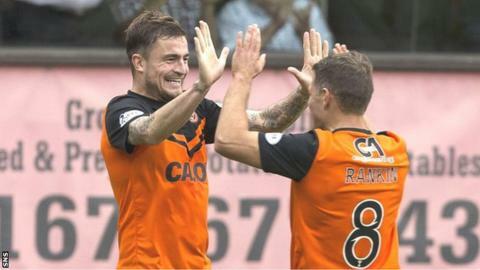 The Dundee United players should follow the example set by Paul Paton, John Rankin and Andy Robertson if they are to improve, argues Jackie McNamara. Seven wins from 10 games has earned United second-top spot in the Scottish Premiership so far and have beaten derby rivals Dundee in the League Cup. But manager McNamara is demanding more. "If they have the work rate and application that Paton and Rankin and Robertson have then they will make it to the very top," he told BBC Scotland. Paton and Rankin have been key performers in the United midfield as the team have remained unbeaten at home in the league. "Last year a lot of our good play started from the back. We seem to be more direct at the moment but it's something that we're working at." However, the flair that characterised United's play last season, when Robertson starred down the left flank before his £2.85m move to Hull City, has given way to less attractive but arguably more effective, football. "They [the United players] have the ability," said former Partick Thistle boss McNamara, who wants to see greater consistency from his players. "Young Andy Robertson is in the English Premiership because he gives everything he has. He has desire and heart. "That's things that you can't give to players, that inner strength and belief and desire. When they have that, the sky's the limit. "We've had a good start in terms of points, but I'm always striving for more quality in the game. "A lot of criticism last year was our defensive qualities, that we were good on the eye but soft, that you could get in about us. "Last year, a lot of our good play started from the back. We seem to be more direct at the moment, but it's something that we're working at, moving the ball quicker and opening teams up." The Tannadice manager describes his team as "nowhere near good enough to play in Europe at the moment", but one player who could help United return to beginning moves from defence is John Souttar. McNamara watched the 18-year-old play for the United Under-20s recently, his second match back on his return from an ankle injury sustained before the season began. "He reads the game well and he's getting better as a defender, but his ability on the ball was very important for us last year," said McNamara. "He started a lot of attacks from central defence for us. He drives forward with the ball." McNamara continued: "The biggest thing for me is the fear factor - the players having the confidence and the freedom to go and play football and move about and try to create things rather than letting things happen. "On Saturday, we were very fortunate to win against Partick - we got the breaks - but you get confidence not conceding goals. "Before we played Kilmarnock [a 2-0 defeat that ended a six-game unbeaten run] we were top and we fell flat. "That's why Celtic are so successful. They have players who handle the demands. "It's having that mental toughness to go into games believing you can win them." United's next match is a league match away to Inverness Caledonian Thistle on Saturday.